Our Gurnee, IL area orthodontist, Dr. Paul Kattner, has been providing children, teenagers, and adults with excellent orthodontic care for more than two decades. At Kattner Orthodontics we make use of the latest available orthodontic appliances and technology to help our patients conveniently improve their smiles so they can enjoy all the benefits that from with having straight teeth and a healthy bite for the rest of their lives! These days we see many adult patients in our office who have decided the time is right to improve their smiles with orthodontic treatment. The increase in the number of adult patients is due, in great part, to the fact that there are now many discreet and comfortable orthodontic appliances which are ideal for adults including removable aligners and clear braces. Many adults have come to realize that investing in orthodontic treatment comes with many benefits. 1. Since an adult’s jaw is fully developed the structure of the jaw cannot be changed with orthodontic treatment like it can with a child. 2. More adults have periodontal disease than do children. If you’re an adult with periodontal disease, the condition must be treated before you can begin orthodontic treatment - unhealthy gums can result in bone loss which can weaken the long-term prognosis of your teeth. 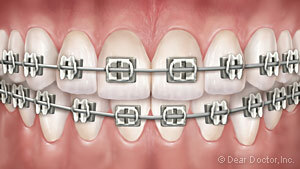 Conventional Metal Braces — Today’s metal braces are smaller, more comfortable and more attractive than the bulky metal braces used in the past. These are the most popular types of orthodontic appliances which are bonded to the teeth for the duration of the treatment process. A thin archwire runs through the bonded brackets to help move the teeth into the desired position, which is carefully planned out by Dr. Kattner. Ceramic Braces — Ceramic or clear braces are similar to metal braces except the brackets are made of a clear material for more discreet treatment. 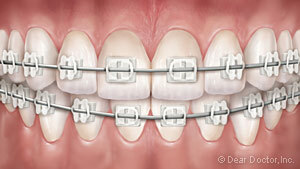 These braces may be ideal for you if you want to improve your smile while avoiding metal braces. Clear Aligners — Invisalign clear aligners are custom-made using 3D computer software that generates a virtual model of your teeth. The aligners are made of a smooth, durable plastic material for comfortable treatment. The aligners, which fit snugly over your teeth, are removable which means you can take them out when eating and when brushing and flossing. You can also remove them for special occasions like family or school photos or job interviews, as long as you put them back in right away when done. If you choose this treatment method you will be given a series of aligners wearing each set for about 2 weeks and then moving onto the next set in the series until your treatment is complete. Once you’re finished wearing braces or clear aligners you will begin the retention phase of treatment during which time you will wear a retainer designed to hold your teeth in their new positions. It is absolutely essential that you wear your retainer as directed so your teeth don’t shift back into their original positions. If you’re an adult who would like to enjoy the many benefits that come from having a healthy and beautiful smile we welcome you to our practice in Waukegan, IL! 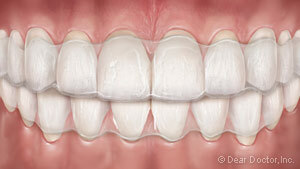 We see adults in our office every day who are working on improving their smiles with braces or Invisalign. Simply request an appointment today to get started on your journey toward an amazing smile. We love meeting new patients and look forward to seeing you soon!